Webcams, along with weather stations, are a potentially useful source of information about the weather now in the Lake District and these are some of the ones we're currently aware of. If you know of any others then please let us know, especially if they fill in gaps in the map. One word of warning however: it's not unusual for them to stop producing new images. However most of them are time stamped so it's easy enough to check that the image is up to date. Some, which show video rather than still images, still rely on Flash rather than HTML5 for the display of the video so you may find you can't use those if you're using an up to date browser. Sadly there's not a lot we can do about that but hopefully they will be upgraded to support the latest browser standards eventually. This is where they are all located. You can click on their icon to get to their details quickly. Here's details of each webcam. Note that the images you see below and on the map are samples, mainly taken on nice days. Click on any of them to see the latest available version. 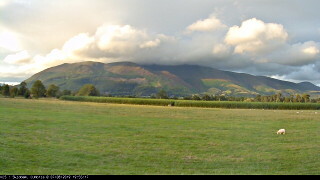 Keswick Computers have a live webcam looking across Keswick towards Skiddaw and a second in Threlkeld looking towards Blencathra. 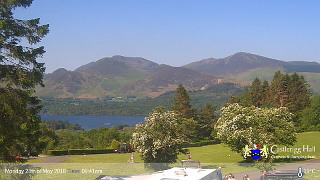 You can watch live video from Hazeldene Hotel in Keswick looking towards Derwent Water. The Climbers Shop in Ambleside have a webcam looking over the roof tops to the Fairfield horseshoe. 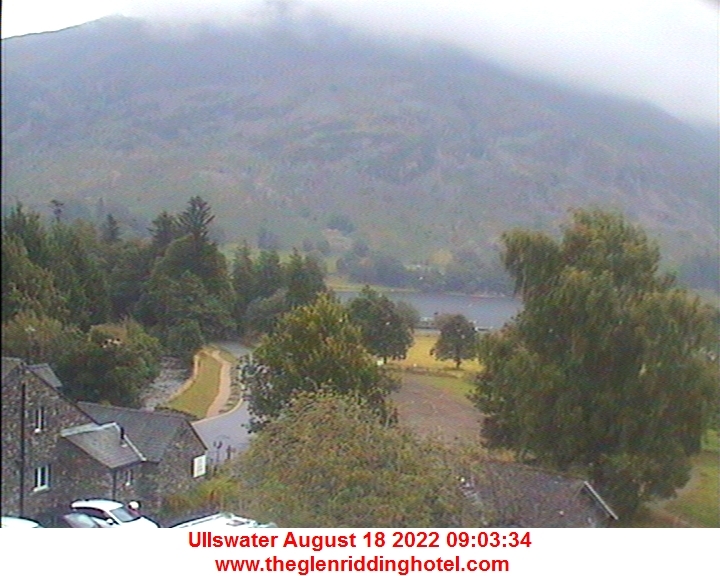 Glenridding Cybercafe have a webcam looking towards Place Fell which updates every couple of minutes. 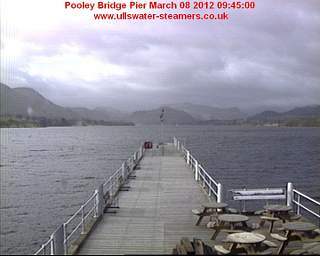 Ullswater Steamers have a webcam pointing along their landing stage at Pooley Bridge. 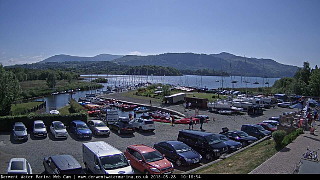 Derwent Water Marina have a webcam pointing across their dinghy park at the top of Derwent Water. 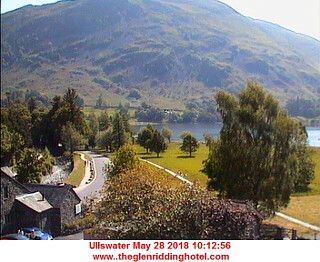 If you have Flash version 10.1 or greater installed then the Three Shires Inn in Little Langdale have a webcam which pans in various directions, including Little Fell, Holme Fell and Wetherlam. 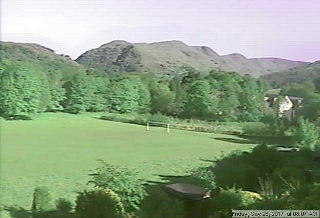 Ambleside Online have a webcam pointing at Nab Scar and the ridge along to Fairfield. 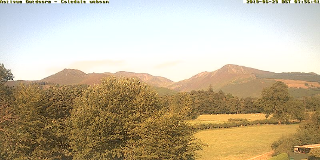 George Fisher have a webcam pointing across Keswick to the slopes of Skiddaw. This is live video and, at busy times, you don't get a picture. George Fisher are aware and are looking at upgrading it but for now just try again later. 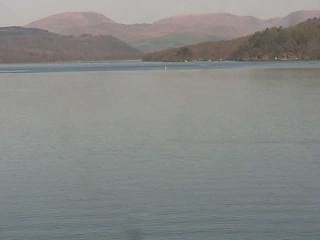 Windermere Lake Cruises have a number of webcams at Lakeside, you can choose the view. This sample image is the one pointing northwards to the Fairfield Horseshoe. 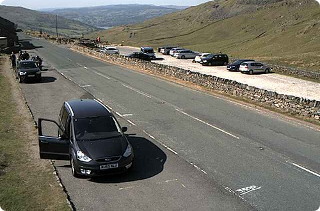 Cumbria County Council have a weather station and webcam on the A592 looking towards the Kirkstone Pass Inn car park, and the junction with The Struggle road down into Ambleside. 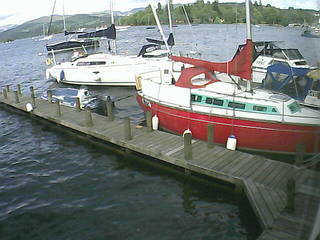 Lakeland Adventures have two web cams at their base at Bowness-on-Windermere, one of which looks over Windermere. 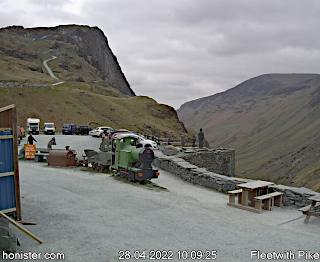 Honister Mine have a webcam located at Fleetwith Pike. 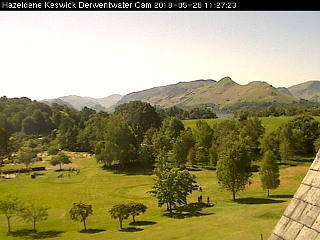 Castlerigg Hall Caravan & Camping Park have a webcam looking down across Derwent Water towards Catbells. The page also has the latest BBC weather observations at Keswick. 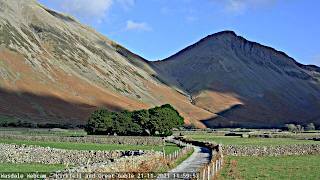 Wasdale Head Inn have a webcam looking towards Great Gable and Kirkfell which is updated hourly. The Coppermines Lakes Cottages have a webcam looking down into the heart of Coniston village. 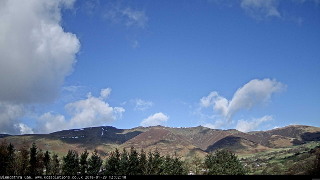 Activus Outdoors in Keswick have a live streaming webcam pointing at Coledale. It also features a weather station if you have Flash on your browser. 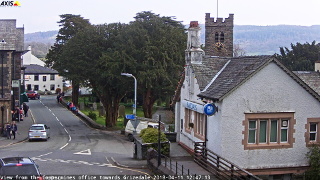 The Langstrath Country Inn in Stonethwaite have a webcam pointing up Borrowdale which is updated every fifteen minutes.